What a beautiful blanket! I've received a lot of handmade gifts for my daughter this year. My mom's cousin knitted her some mittens, a few hats, 2 scarves, dresses, blankets, and the list goes on! I love when she gets homemade gifts =) Thanks for linking up at Momma T and Baby E! Thanks for stopping by Hardly a Housewife! I'm following you too. Wow, that is lovely. Thanks for linking up at Tots and Me. Nice blanket. I had every intention of making Christmas this year, but in the end ran out of time so many, many gifts made by others from Etsy. How pretty! I love handmade gifts. I give lots of ornaments made by me every year. You saw the dollhouse that I will be attempting to put together to donate next year, but this year I gave away three handmade gifts. You can check them out over at http://off-the-deep-end.net/1530/sometimes-handmade-is-best/. (Hope that link works. I write for Off The Deep End and also my own blog, www.lifeonthedomesticfront.blogspot.com. Thanks for the follow and I look forward to reading about you and your family. My youngest son has autism, so I am all about special needs! Ahhh that is so sweet! I just got my hands on a sewing machine and I am planning on getting back into sewing (I was a little 4-H sewing kiddo long long ago). Check out my blog! I'll be following! aww great gift thanks for linking up at the Zoo WW. 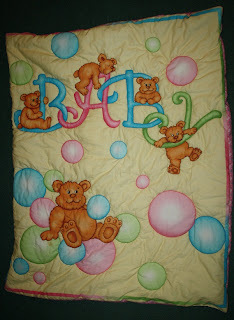 Thank you for stopping by my blog I'm glad you liked my post :) This blanket/ quilt is really beautiful. I can barely sew a button LOL. I admire your skills very sweet. What you made is beautiful! I would have taken longer to complete something as detailed as this. My craftiness is making hats on the loom this winter. I've made 3. Hi Tara, thanks for showing me love on modernmothersclub.com. I always support my fellow mom bloggers......Wow you sure have talent because that blanket is beautiful. If it didn’t take so long to make I would tell you to make it into a business. Thank you for stopping by Indiana Inker. Your blanket is adorable!! You did a great job! I'm now following you via GFC. I am in awe of your talent!! I am such a wannabe crafter and am always amazed by those who actually have skill!! Very Cool! Happy New Year!! That is so beautiful and I am sure your daughter will treasure it. I love making quilts for children. Most of what I make aren't heirloom quality - made to use and abuse and love! They can never have too many blankets and quilts!